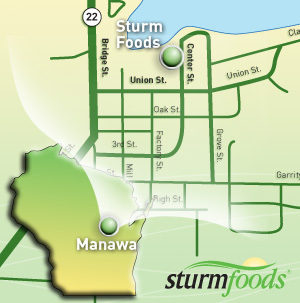 Sturm Foods is located in the beautiful heart of Wisconsin, 50 miles west of Green Bay, 220 miles north of Chicago and 240 miles east of Minneapolis. We are easily accessible via the Outagamie County Regional Airport in Appleton, which is serviced by Delta, Northwest, United and Midwest Express. From the Airport parking lot turn left on CE. This will take you through a stoplight and to the junction of Highway 15 (1.5 miles). Turn left at that stoplight and travel until you junction with Highway US-45 (2 miles). Follow US-45 to New London, (14 miles) where you will come to the junction of Wis. 54. Go West on Wis. 54 to a small town called Royalton (6 miles). Turn right on County B. This will take you directly into downtown Manawa on Bridge Street. Turn right on Union Street. Turn left on Center Street. The Sturm Foods office is just around the corner. Take I-90 north to the Portage area where you will exit on I-39 (Highway 51). Continue north on I-39 to Plainfield. Exit I-39 onto Highway 73 East through Plainfield. Just on the east side of Plainfield exit onto Country Trunk P (left turn). Follow County Trunk P to Highway 22 (stop sign) and then turn left onto highway 22. Follow Highway 22 all the way to Manawa, about 28 miles. From Bridge Street, turn right on Union Street. Turn left on Center Street. The Sturm Foods office is just around the corner. Take 294 bypass north around Chicago. Take I-94 west up to Milwaukee, where you will pick up the 894 West bypass. Take 894 to US-45 north. Take US-45 to US-41 north to Appleton. Exit onto US-10 west. Continue on to Weyauwega, (25 miles) where you will exit to the right on highway 110. Travel north on 110 for 6 miles until intersecting with Highway 22/54. Make a right turn onto 22/54. After 3 miles, highway 22 will split from 54, heading north. Turn left and drive into downtown Manawa (5 miles).